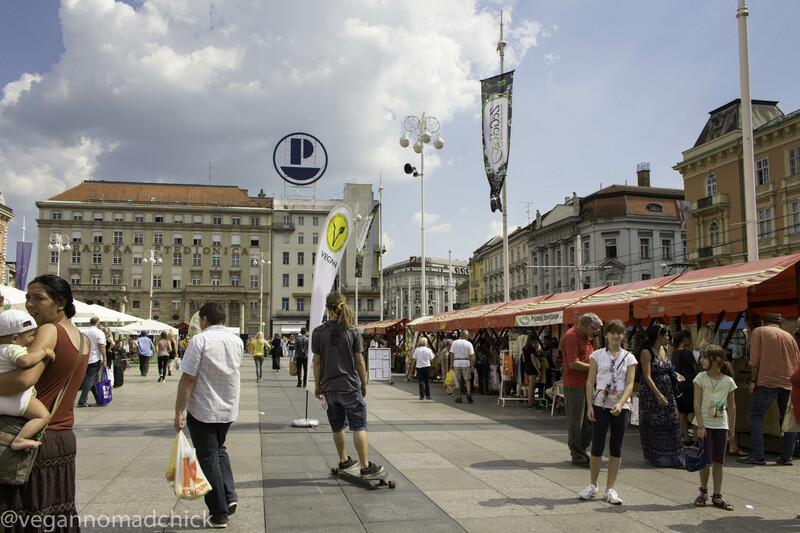 I arrived in Zagreb just in time for the largest vegan festival in this region. 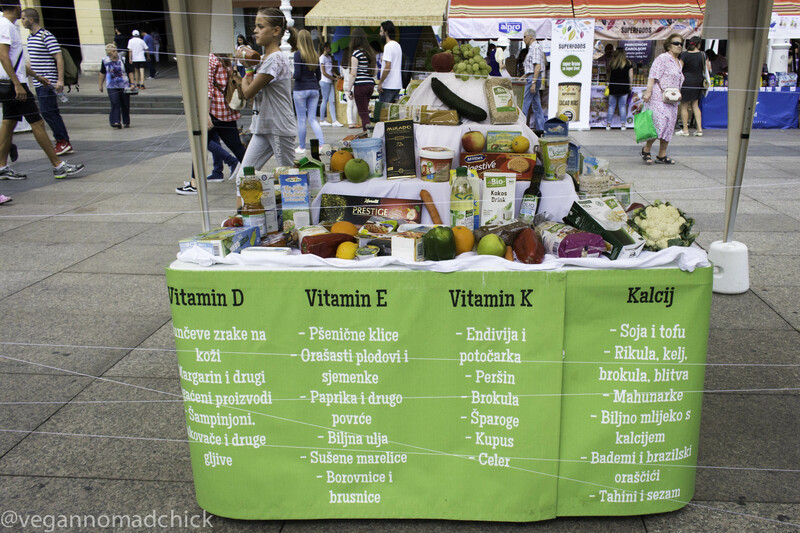 The ZeGeVege all-vegan festival went down in Zagreb’s main square this past Friday and Saturday. It went on from 9-9 on Friday and 9-7 on Sunday. 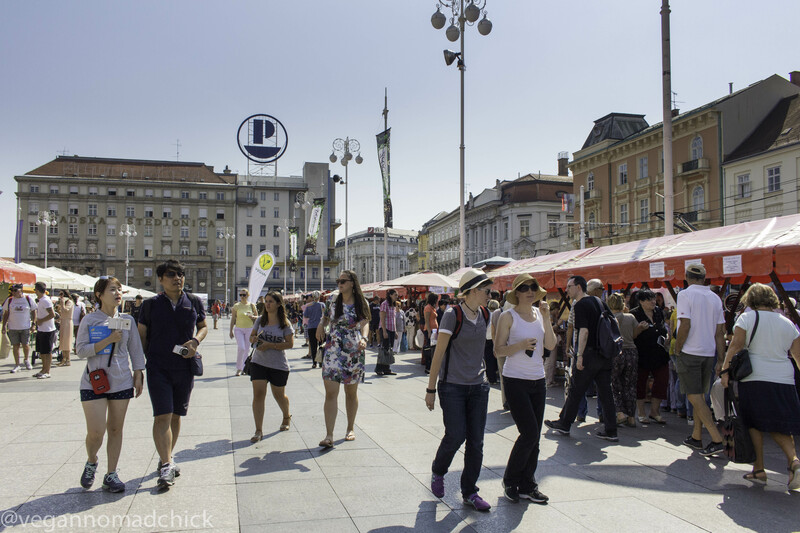 I browsed the festival on Friday and returned on Saturday with a new friend (we met in Ljubljana), her boyfriend, and their friend. All of them are vegan and I’m so glad they were able to meet up with me at this festival. I love making new friends while travelling, especially if they are vegan. I’ve been spoiled since I left the States because all of the friends I’ve made since then are vegan. Vegans sure know how to network online! Everything at the festival was 100% vegan. Dozens of stalls lined the square. 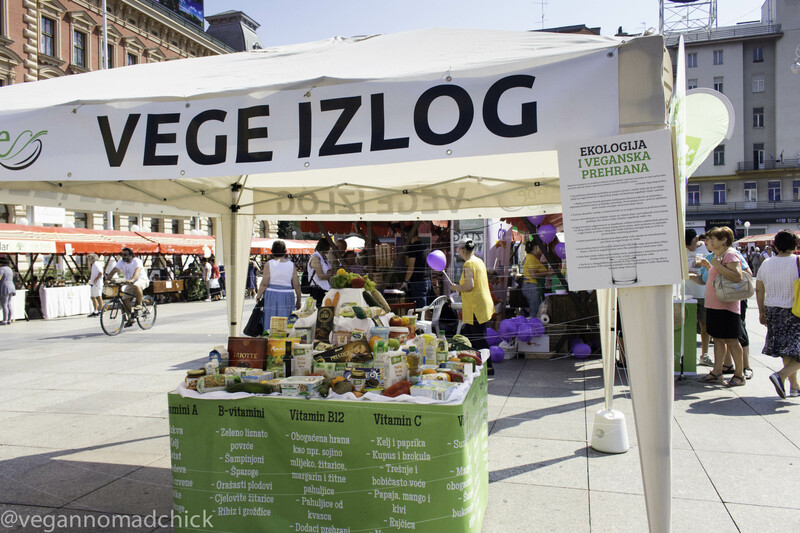 According to the ZeGeVege website, this festival had a record 100 stalls promoting vegan-friendly products and food. Most of them were local vegan companies and restaurants offering plenty of samples like mock meats, vegan cheeses, dips, and snacks, but vegan vendors from abroad, like Alpro, were also there. 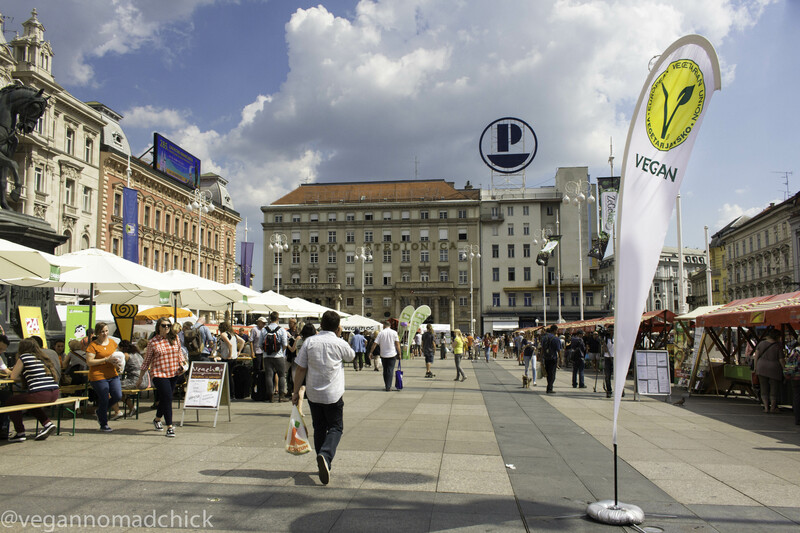 Of course, no vegan festival would be complete without several restaurant stalls replete with burgers, sandwiches, döner kebabs, ramen, ice cream, and raw cakes. I was worried the festival wouldn’t have anything for a fruit vegan like me, but surprisingly I found decent watermelon at one of the organic produce stalls. Isn’t this vegan food pyramid cute? If only it contained more produce! I do wish more of the festival would have been dedicated to fresh produce as opposed to processed foods, but if these processed foods convince others to try veganism, I’m all for it. Besides vegan food, you could find clothing, shoes, cosmetics and household products. All of these were vegan and cruelty-free, meaning none were tested on animals. The festival also had guest speakers, cooking classes, dancing, Zumba, and live music. 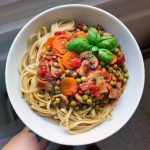 It was basically a two-day long vegan party! The best part about this two-day event is that it was completely free to enter. The location in the main square was excellent and the weather this past weekend was perfect for it. I like the set-up of this festival better than VegFest in Glasgow. 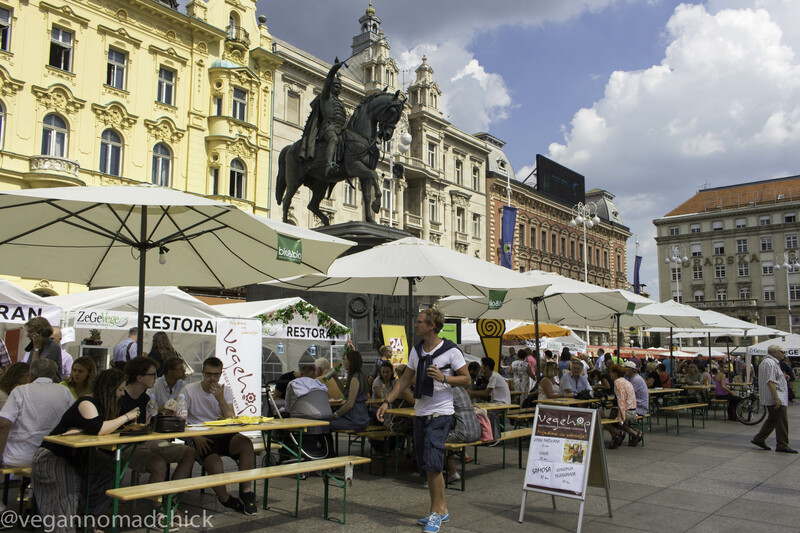 A free outdoor festival in the city’s main square is a better way to reach more people vs. a paid-entry only indoor festival. Granted, the weather in Glasgow in December doesn’t allow for an outdoor festival, but it would be nice if VegFest were completely free. According to the ZeGeVege website, they expected 40K people to pass through the festival. That’s incredible! No matter when I passed through the festival in those two days, the festival was lively and bustling with people. Curious passers-by inevitably wandered into the festival, sampled some vegan snacks, browsed the stalls, and hopefully went about the rest of their day with a new positive impression of veganism. I’m sure thousands of hungry non-vegans were lured in by the food stalls. I hope they enjoyed every bite! I watched people of all ages (many of which weren’t vegan based on their reactions) sample vegan burgers and snacks and comment on how tasty they were. This gives me so much hope for the future! 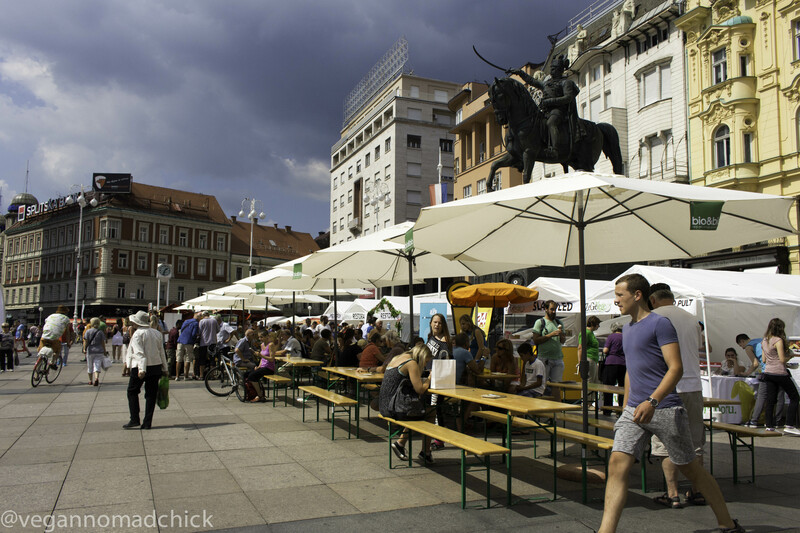 I had the best weekend in Zagreb. Thanks to my new friend Saša for filling me in on this festival. 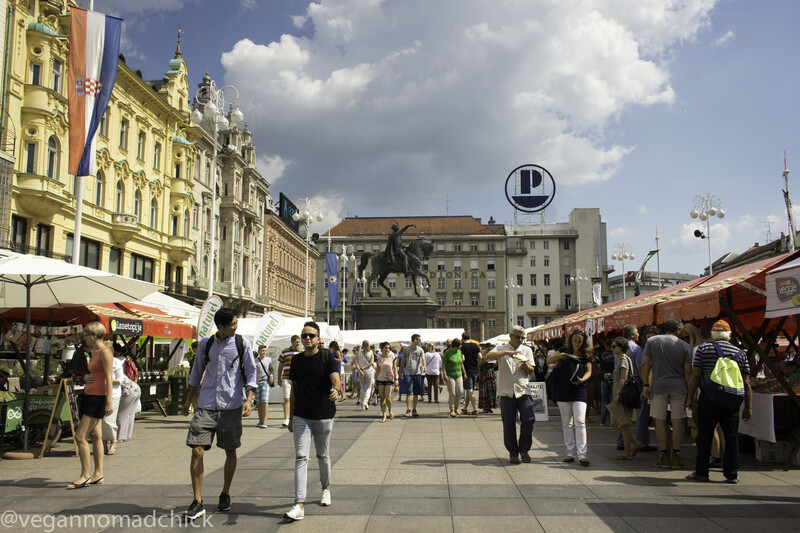 I have a few more days here in Zagreb before I’m off to Split! I wonder what I’ll get into this week. Have you attended a vegan festival before? « Travelling alone as a woman.